Some of the world's first musicians may have been flautists. Archaeologists reanalyzing artifacts from a cave in southern Germany have determined that two prehistoric flutes — one fashioned from bird bone, the other mammoth ivory — are somewhere between 42,000 and 43,000 years old. If the researchers are right, these primitive instruments predate the previous record holder (also a flute) by thousands of years. 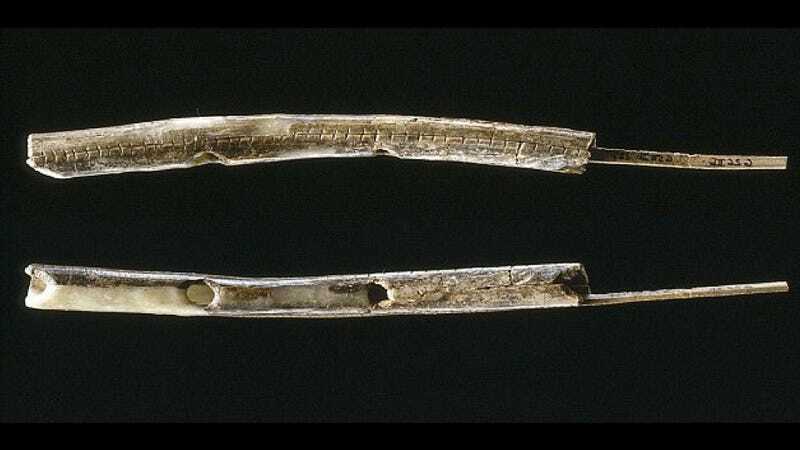 The flutes were discovered in Germany's Geißenklösterle Cave, an important archaeological site to researchers who study the arrival and spread of modern humans in and across Europe (pictured up top is the flute fashioned from mammoth ivory, below the one made from bird bones). Now, a team led by Oxford University archaeologist Tom Higham has used a refined dating method to determine the age of animal bones excavated from the same geological layers as the instruments. Their findings are described in the latest issue of the Journal of Human Evolution. "These results are consistent with a hypothesis we made several years ago that the Danube River was a key corridor for the movement of humans and technological innovations into central Europe between 40,000 and 45,000 years ago," explained Tübingen University researcher and study co-author Nick Conard in a statement. That timeframe is important, because it suggests humans entered the Upper Danube region prior to an extremely cold climatic phase thought to have occurred around 39,000 to 40,000 years ago. Previous investigations have placed the arrival in the Upper Danube as occurring after this climatic phase. "Modern humans during [this] period were in central Europe at least 2,000-3,000 years before this climatic deterioration, when huge icebergs calved from ice sheets in the northern Atlantic and temperatures plummeted," explains Higham.